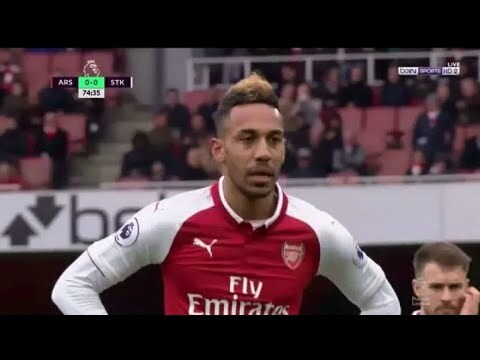 The gunners played at the Emirates Stadium yesterday and they won 3-0 thanks to a great performance from the squad so here are the video highlights of the match. The gunners welcomed the Potters at the Emirates Stadium yesterday as they played their 31st Premier League match and they successfully collected three goals thanks to a double from Aubameyang and one from Alexandre Lacazette to win the match 3-0. The home fans enjoyed their Easter celebrations with happiness as their team had won the match comfortably because most of the fans left the stadium with a smile on their faces except the travelling Stoke City supporters who left the game with gloomy faces. We have brought you the highlights of the match even though it’s a bit too late but try watching it if you missed yesterday’s match. Aubameyang was the first to find the back of the net through a penalty and after doubled the lead moments later with Lacazette closing the chapter with a beautifully taken penalty goal to give the Arsenal team a well deserved three points.